Hi, all! At the Romantic Times Conference this past May I had a bit of an epiphany while shopping for books with my teen daughter. We (readers) really want information on new to us books. This may sound simple, but I was shocked how little information, even at a reader conference, there really was about the books. There were lots of cute promotional bookmarks with fun images and quotes from some author or another that the author of the book thought readers would be impressed liked their book. But there was very little to actually tell you what the books were really about so you (or my daughter) could make up your own (or her) mind. So, I decided, as I have time, to help introduce my readers to New To You Books. What type of reader would your book appeal to most? Readers of mystery and romance who enjoy engaging stories filled with humor, family relationships, and animals– and without graphic violence or vulgar language. Who is the main character? What does he or she want or what is his or her biggest struggle to over come? Leigh Koslow, an advertising copywriter about to turn 30 with a dry wit, a tendency to look for love in all the wrong places, and a family more than willing to point out all her flaws! What plot line drives the story? Leigh has moved into the newly renovated Victorian home of her cousin Cara, to keep her company while she awaits the birth of her first child with a husband overseas. But somebody wants the women OUT of the picturesque house on the bluff of the Ohio River. And that somebody means business. How is your book different than other books in the same genre? My editor once said that what he liked best about my books was that they had no “schtick” or “gimmick” that drove the series, but instead were brought to life by their colorful characters and unique storylines. Does your book have romance in it? If so how important is it to the story? Is your book part of a series? If so what are the other books (in order) in the series and will there be more? Leigh Koslow Mystery Series: Never Buried Never Sorry Never Preach Past Noon Never Kissed Goodnight Never Tease a Siamese Never Con a Corgi Never Haunt a Historian (2013) and yes, there will be more! If your book is part of a series, what makes it a series? Continuing characters, tone, and style, although each book’s plot is different. Some are typical whodunit murder mysteries, others have a different sort of puzzle, but you may not know which is which until the end! If your book is part of a series, should readers read the books in order? Order doesn’t matter to solving the mysteries, but it makes a better reader experience in terms of character growth, especially watching the unfolding romance! Where can readers get your book and when? 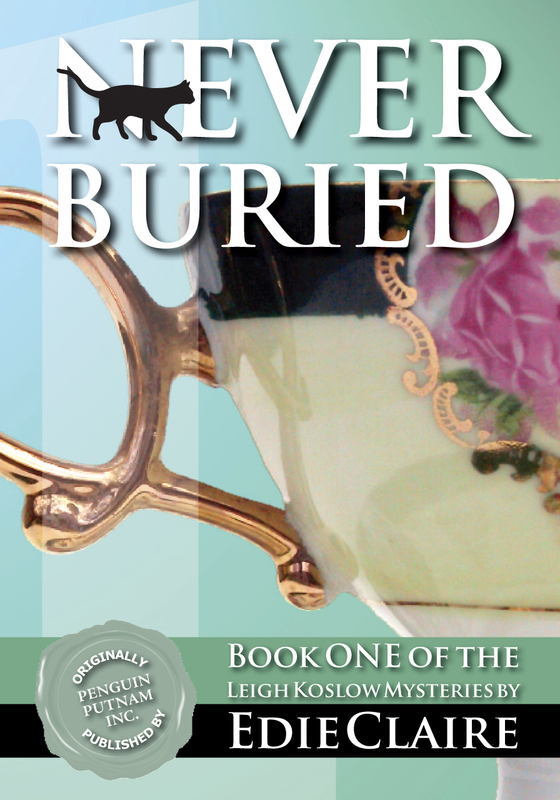 You can try Never Buried for FREE as an ebook in all major outlets. Trade paper is also available on Amazon for $9.99. Is there anything else you would like readers to know about your book? Visit my website for a link to a blog I wrote about how doing research for the book almost got me arrested! Would you be willing to supply a prize for one reader? ← Can you really tell the difference between a malamute and a husky just by looking? This is a great idea! Thanks!